LAHORE, 20th October 2015: Each year, on the 20th of October, members of the World Association of Chefs Societies (WACS) celebrate the International Chefs’ Day. 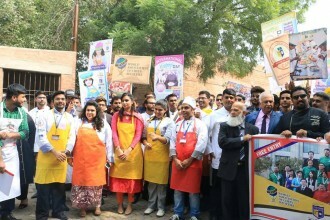 As members of the WACS, the Chefs Association of Pakistan (CAP) and College of Tourism and Hospitality Management (COTHM), Pakistan organised full-day events to celebrate the occasion in 10 major cities of Pakistan including Lahore, Karachi, Islamabad, Multan, Faisalabad, Okara, Sheikhupura, Sahiwal, Rahimyar Khan and Bahawalpur. This year’s theme was ‘Healthy Kids, Healthy Future’. More than 5000 chefs, cooks and other revered guests from the Hospitality, Travel & Tourism Industry participated in the events. In the countrywide ceremonies, rich tributes to unparalleled talent of Pakistan’s chefs and the chefs’ fraternity around the globe were paid. Chefs’ walks and seminars were organized to raise awareness about the profession, theme of the day and to recognize services of outstanding professionals of the Hospitality Industry of Pakistan. As part of the celebrations, CAP Hospitality Award ceremony was held in Lahore at Alhamra Art Centre, Mall Road, Lahore. Before this ceremony, Chefs’ Walk was held at the venue in which balloon releasing was also done to mark the occasion. MNA Mrs. Shaista Pervaiz graced the event as the chief guest. Renowned journalists Mr. Mujeeb-ur-Rehman Shami and Sohail Warraich, City42 Bureau Chief Naveed Ch., Education Minister Punjab Rana Mashood Ali Khan, Irshad Arif, Syed Noor, CEO COTHM & CAP Secretary General Ahmad Shafiq, Chef Muhammad Raees, Chef Mukesh Khaimji, Pearl Continental Hotel’s Executive Chef Christopher Jayweeria, Director Operations of Yum Chinese & Thai Restaurant, Spice Bazaar & Chasni-The Sweet House Ch. Nisar, Pearl Continental Hotel’s Executive Assistant Manager Nadeem Ch., Faletti's Hotel’s Director Operations Irshad B. Anjum, CAP Vice President-Corporate Waqar Iliyas Khan, Park Lane Hotel’s Executive Chef Muhammad Yameen and many other noted politicians, bureaucrats, journalists, hospitality industry professionals, showbiz personalities, civil society members, activists, teachers, students, children and people from various walks of life participated in the event. At the awards’ ceremony, awards were given to the best chefs in recognition of their excellence and contribution to the field. Shields, souvenirs and certificates were also given to the winners of cooking competitions, cooking classes’ participants and other contributors from the industry who took part in the chef’s day celebrations started by CAP and COTHM since 6th October 2015. It is pertinent to mention here that all these 2-week long celebratory activities followed this year’s International Chefs’ Day theme. Addressing the participants, CEO COTHM & CAP Secretary General Mr. Ahmad Shafiq said that Pakistan’s hospitality, travel, tourism and culinary industry represents extremely talented professionals of Pakistan. The CAP is making progress with each passing day as more Pakistani chefs and other professionals are joining its ranks from not only across the country but abroad as well. He said the association is working hard to get the Pakistani cuisine recognized as one of the authentic international cuisines. Speaking about the potential of chefs’ profession, he said this industry is one of highest paying and employment generating sectors of the world. Focus on its development and progress can change Pakistan’s fate. He said CAP and COTHM have been working hard for the past ten years to highlight the potential of Pakistani cuisine, hospitality and tourism. Mr. Shafiq also revealed that the CAP was also forming a National Culinary Team of Pakistan to represent the country at international culinary competitions and other events. CAP’s Vice President-Corporate Mr. Waqar Iliyas also spoke to the participants. He thanked the members and participants for their unceasing support and enthusiasm. He also shared the organisation’s vision 2016 which is focused on expanding its outreach across the world, efforts for the welfare of Pakistani chefs and Pakistani cuisine’s reintroduction and promotion as one of the best cuisines in the world.